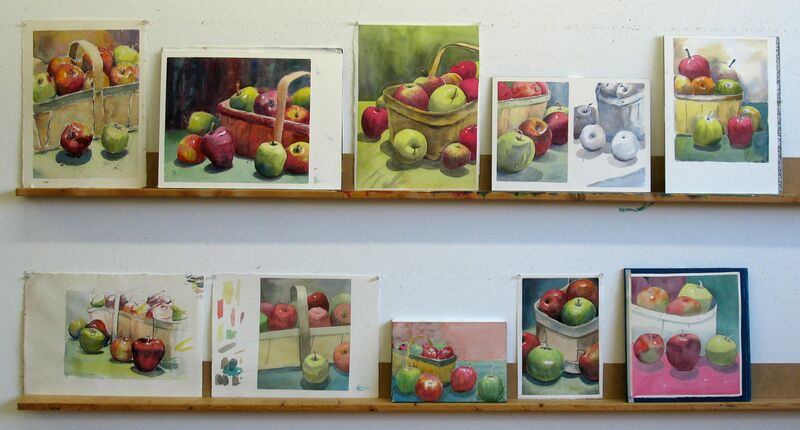 Please, bear with me as I tell you about last night’s watercolour class at the Dundas Valley School of Art. Our still-life comprised of cuddly critters was a great opportunity to talk about soft edge techniques. First of all, I broke down the bear into it’s component parts (ears, arms, nose, paws). Last week, I used a very similar approach with the colourful gift bags. 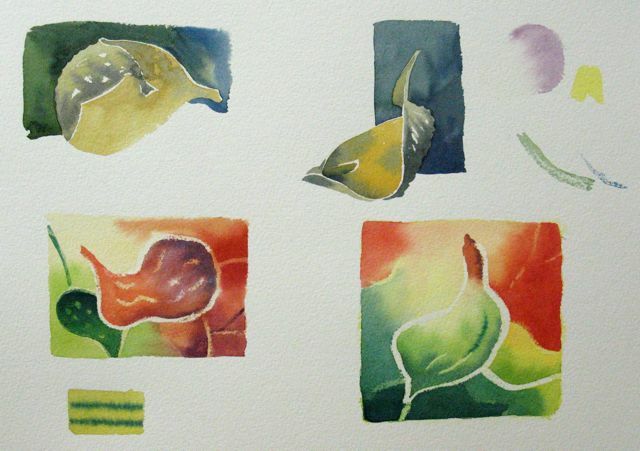 I painted each shape with a light wash and touched in a darker version while it was still wet. This created a soft edge. It’s easier said than done and takes a lot of practice. One of the students completely ignored the soft edge process and developed his image with values. This was fine with me. You may recall that I presented this approach a few weeks ago. David would like to improve his understanding of value and is quite happy to devote more time to it. Later on, he glazed some colour on his piece. Look for it in the critique. I also urged everyone to pay a bit more attention to their compositions. Their thumbnail sketches took time and it slowed them down a bit so several ‘works in progress’ are featured in our critique. Don’t forget to click on a critique image to view a larger version. 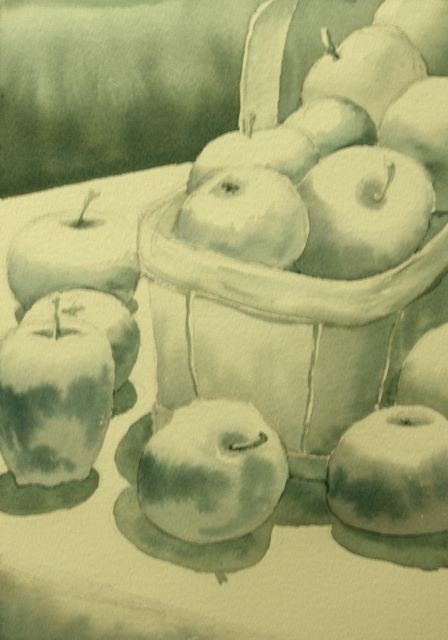 Fall Tuesday Watercolour Class – More Apples! The Tuesday classes were back in action yesterday. 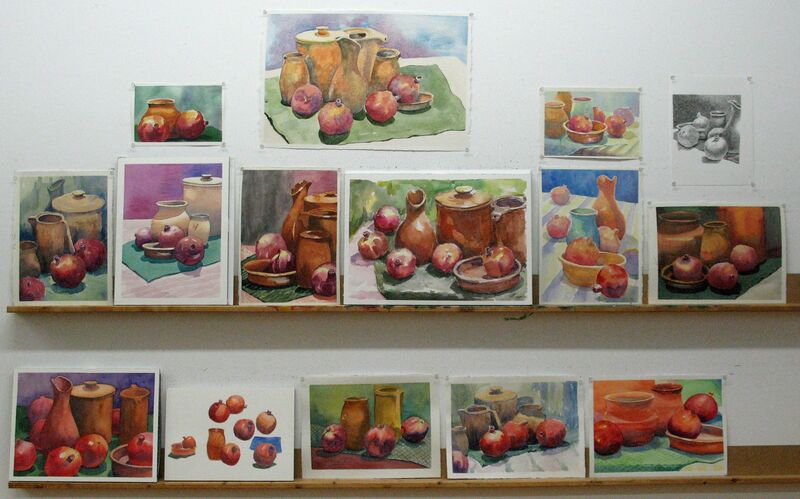 They worked from the same still-life that was used for the Sustained Saturday group on the weekend. 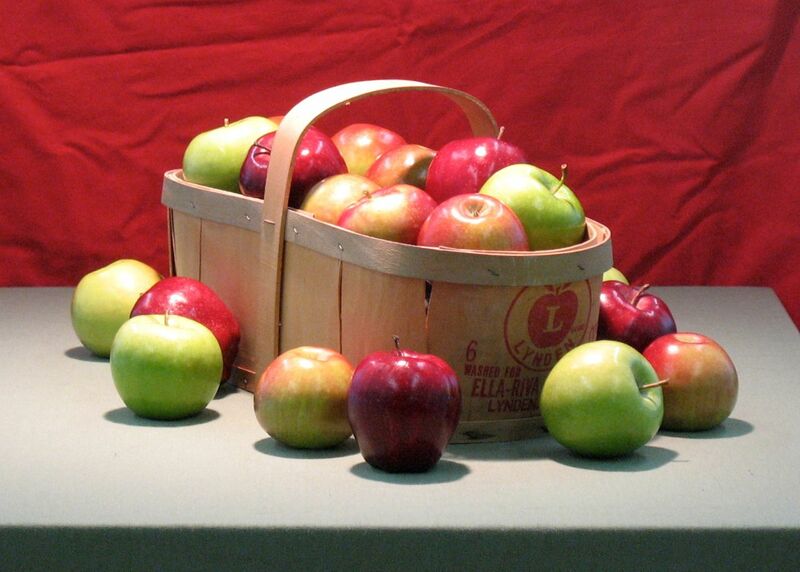 Here’s a different view of the still-life. Back to basics was the order of the day again, especially after a long summer layoff from studio classes. In addition to that, I met some new students yesterday. Although all of them had some prior experience with the medium, I wanted to expose them to some of my ideas about drawing, value and simplification. I focused on those elements with my demonstrations. This is the preliminary drawing for the study of the pitcher on the lower left of the sheet. As expected, many of the students concentrated on fundamentals and spent their time on studies. It’s valuable experience and should pay off in the months ahead. Most of the more experienced students started off with thumbnail studies, as usual, and then developed a sustained image. A funny thing happened on the way to teaching this fall. Last June, I gave up my studio in Toronto. Yesterday, I taught in the same studio. Here’s what happened: Eight of my students collectively took over the lease on my former studio and formed Arts on Adrian. I’m now a tenant. As far as my classes go, it’s business as usual. Anyone is welcome to sign up for a class. We had a small group yesterday but, overall, enrollment is very good and the transition has been smooth. I’ve loaned all of my studio furniture and basic equipment to Arts on Adrian. I’ll tell you more about the group and their activities in a future post. I’m very grateful to them and to all of my students who continue to support me. What is the goal of a demonstration? Usually, a demonstration shows a process or a specific technique. I often use a demo to illustrate a concept. 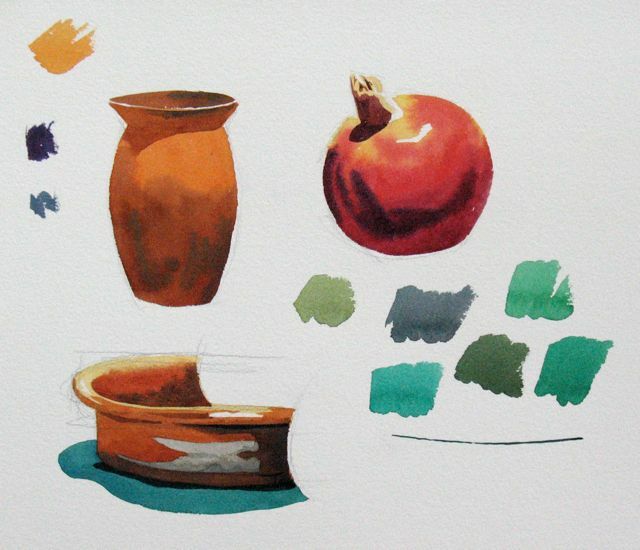 Yesterday, I discussed several aspects of colour and composition with the students and I painted as I talked. Everyone in the class has a good watercolour skill set so demonstrating a technique or approach didn’t seem necessary. 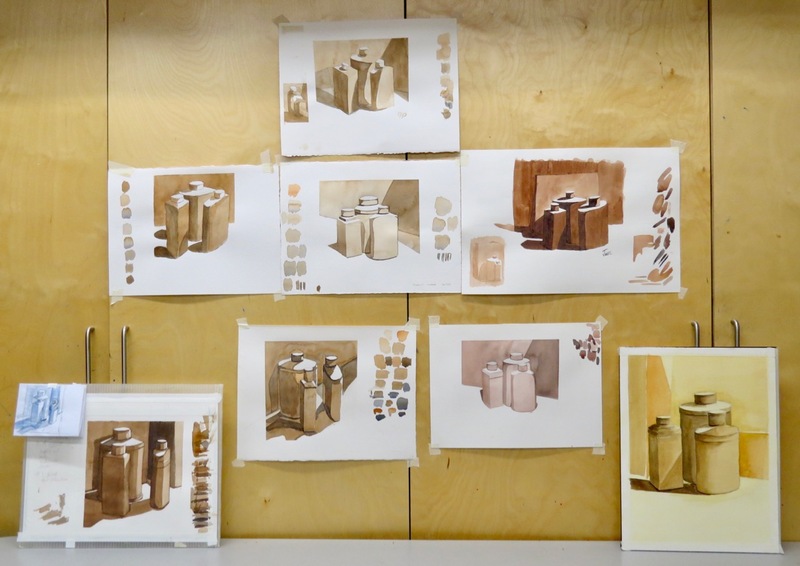 Also, it was the first class of the Fall term and ideas about colour and composition can always be refreshed. 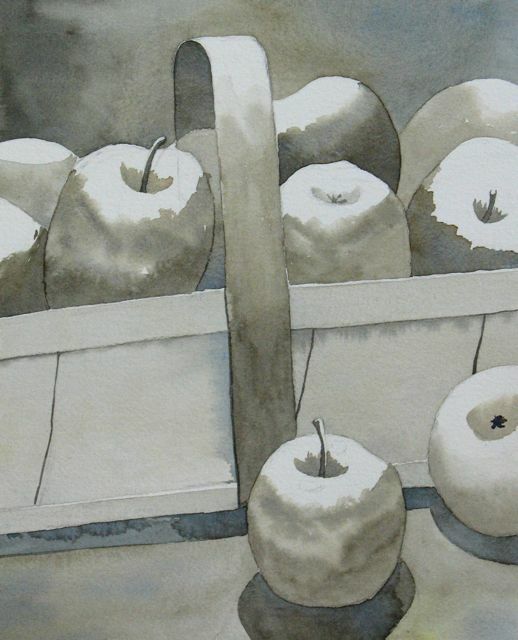 Keep scrolling to see the lovely watercolours they created. Before you get to them I’d like to thank all of you followers as this blog received it’s 150,000th view a few days ago. Stay tuned for a busy term. 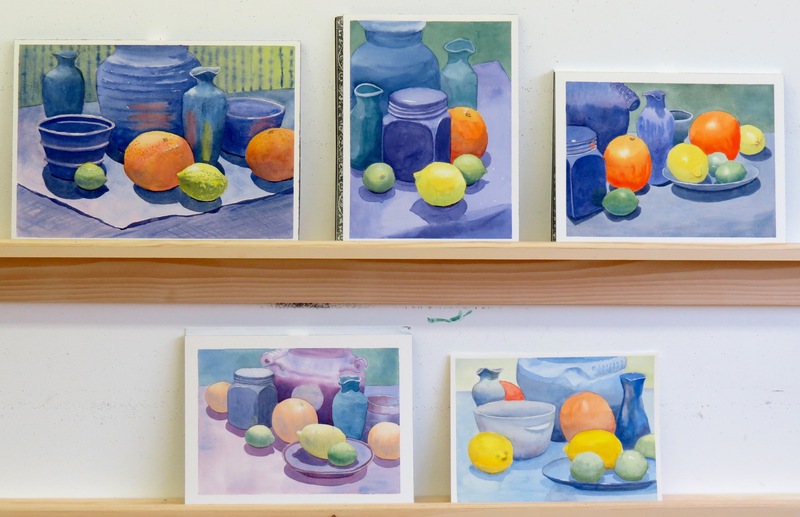 Not only do I have a Fall Studio Calendar at Arts on Adrian but, in a month, I’ll be off to Sicily to lead a two-week watercolour workshop! 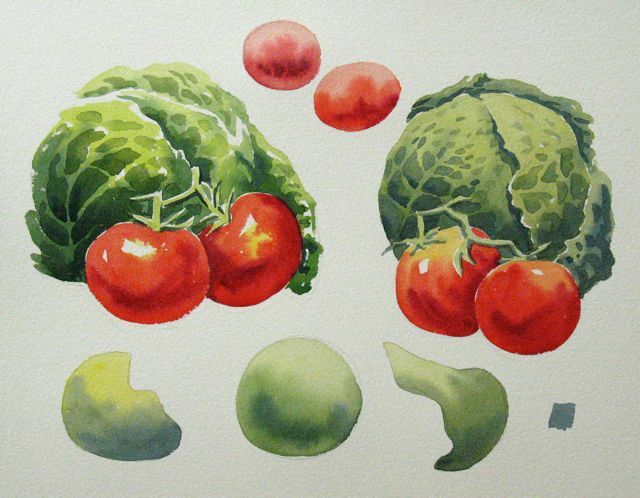 Tuesday Watercolour Class – Week Nine! 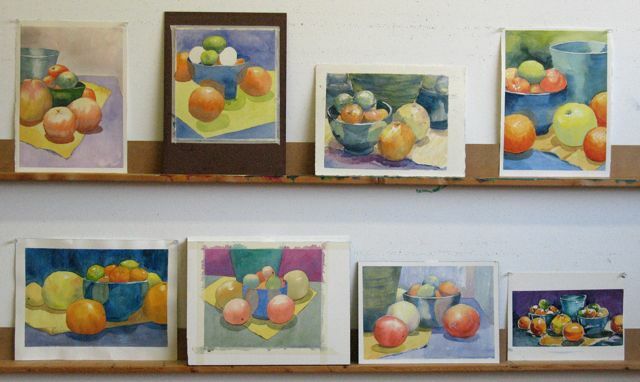 One day last spring, I chose not to set up a still life and gave everyone a seashell to paint. It was a very creative exercise and the students tried all sorts of ideas. The results were quite dramatic and varied; everything from traditional treatments to some exciting abstractions. Even better, everyone had fun. Yesterday’s subject was milkweed. Natural, organic forms. The milkweed pods started out in the middle of the room as seen in the photo but, after my demonstration/discussion, each student picked one to take to their personal work table. My demonstration sheet shows two fairly literal studies and two playful explorations. I had a short checklist from the shell class and we considered different ways of exploring the milkweed. I don’t believe imagination can be taught but it can be stimulated. 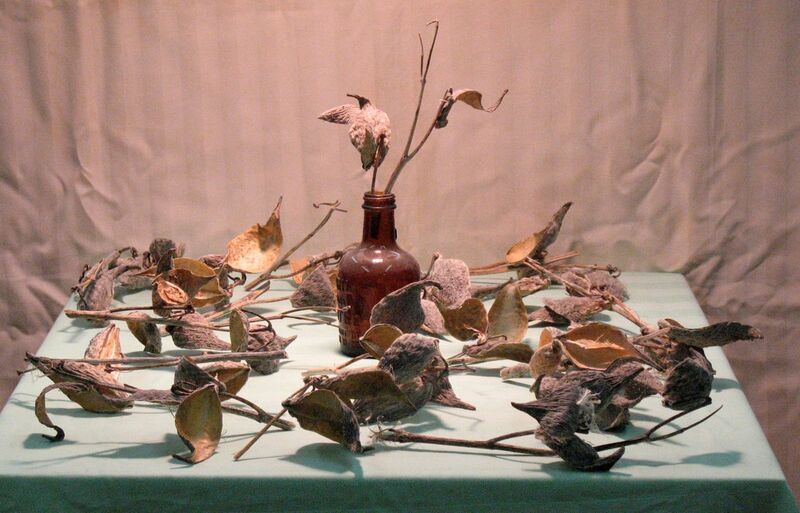 The students were intrigued by the milkweed as a subject and approached the project very thoughtfully. They came up with some wonderful watercolours. 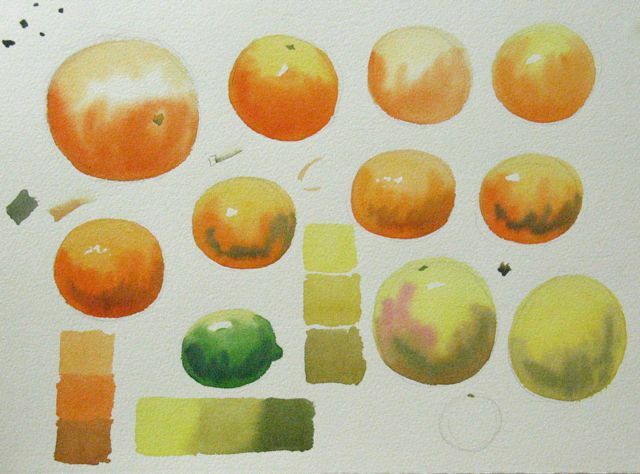 Sustained Saturday Watercolour Class – Pomegranates! The pomegranates from Tuesday went into cold storage for a few days and were good to go for the Saturday group. 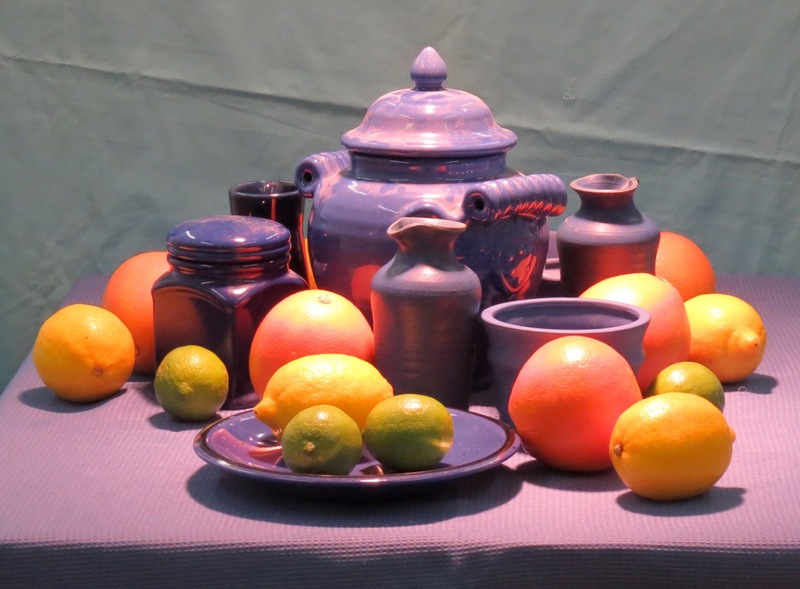 I set them up with terracotta objects and the still life had a more monochromatic look than it did on Tuesday when they were grouped with dark green pots and vases. Value is always of fundamental importance in painting and drawing but, possibly, even more so with a monochrome subject. 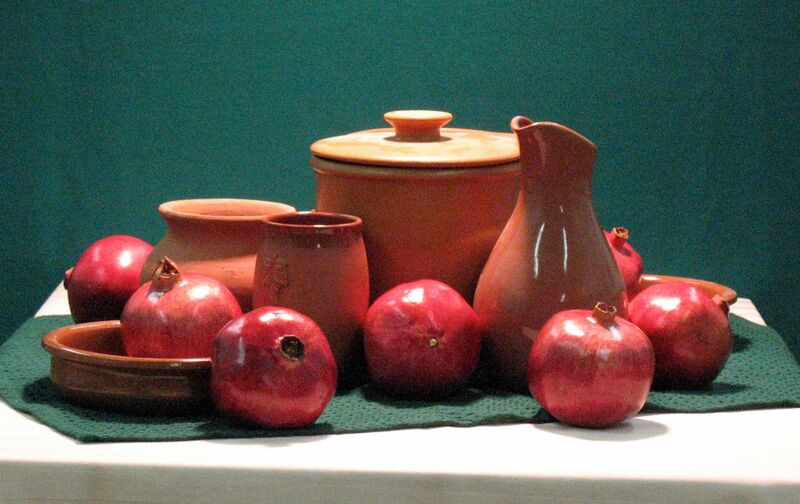 How do we make dark red pomegranates stand out from the orangish pots and bowls? For starters, keep the lightest areas as light as you can. The light hitting the top of my pomegranate is barely darker than the white paper. If I placed a terracotta pot behind it, even a shadow of middle value would be able to set off the light to real advantage. Secondly, we have to achieve dark values for the shadow areas of these orange and red objects. That’s where blue comes in. I used Cobalt Blue to darken the values on my study sheet. Ultramarine Blue would also do the job. 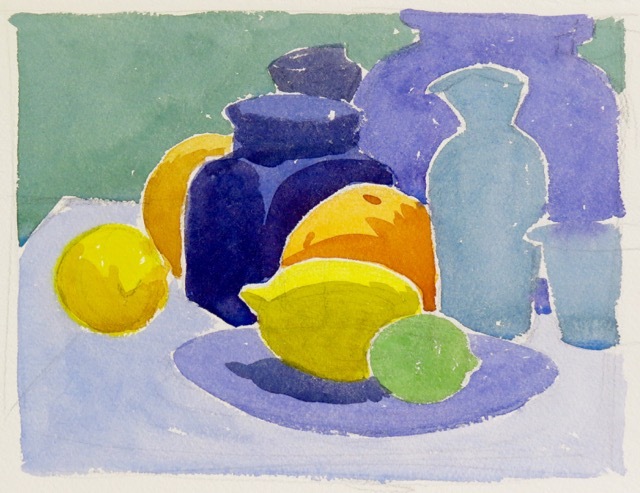 Blue is very powerful and gives the shadows the needed depth. It was a full house at the studio today and it was a good place to be. Nice and warm with the smell of coffee and fresh baked goodies and crackling with creative energy and quiet jazz. Outside? Don’t ask! November was not at it’s best. We had a lot of fine work to view at the end of the day. 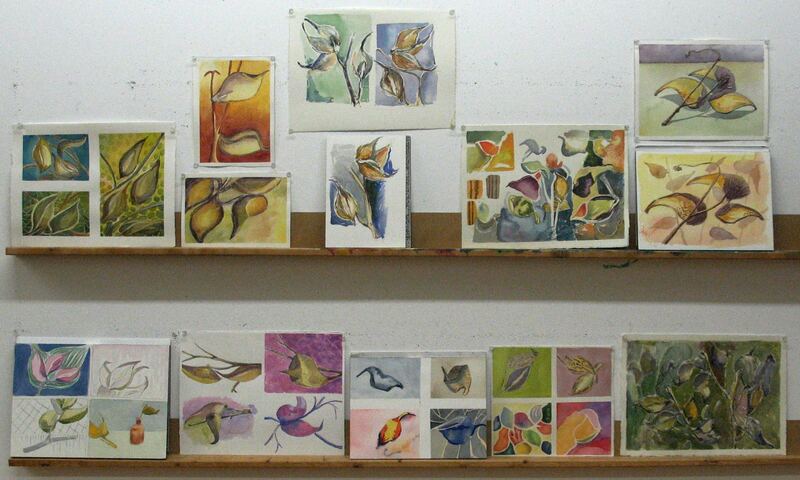 Several of the students did more than one painting and many spent time on studies and sketches, as well. The pomegranates have done their bit and now will go to their final, tasty reward. 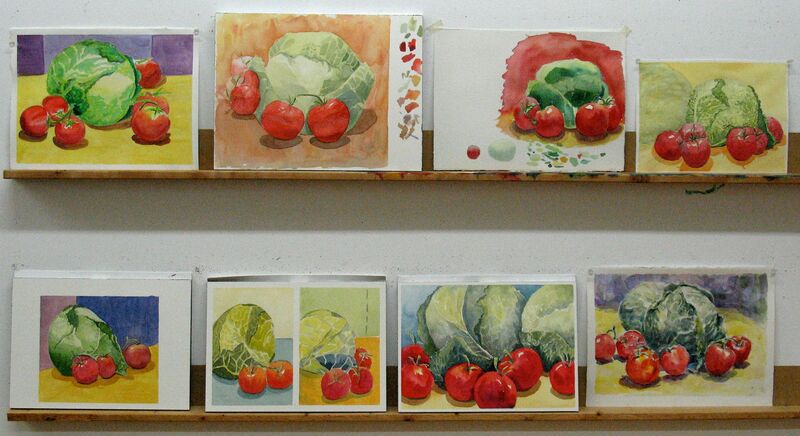 It’s been a long, long time since I put a cabbage into a still life. I was at the grocery store, picking out the lovely tomatoes with the vines on them and wondering what to have with them, when I noticed the Savoy Cabbages. Decision made. 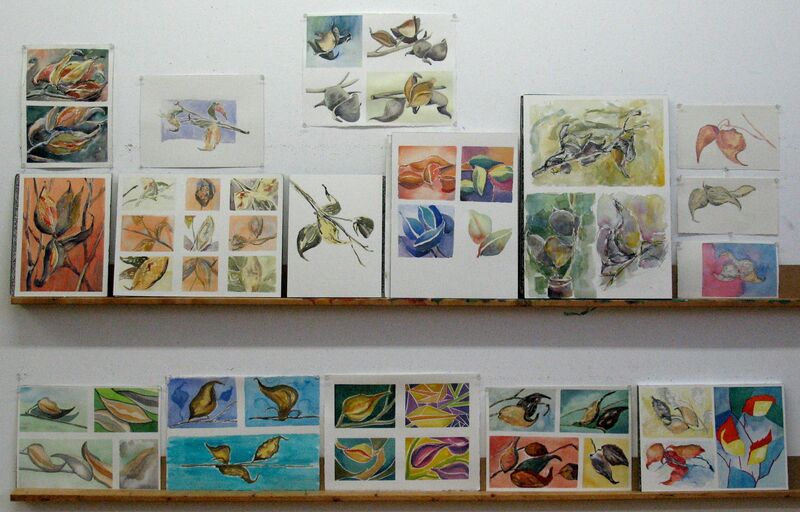 I didn’t want to turn my demonstration into a botanical study and aimed to ‘suggest’ more than ‘depict’. 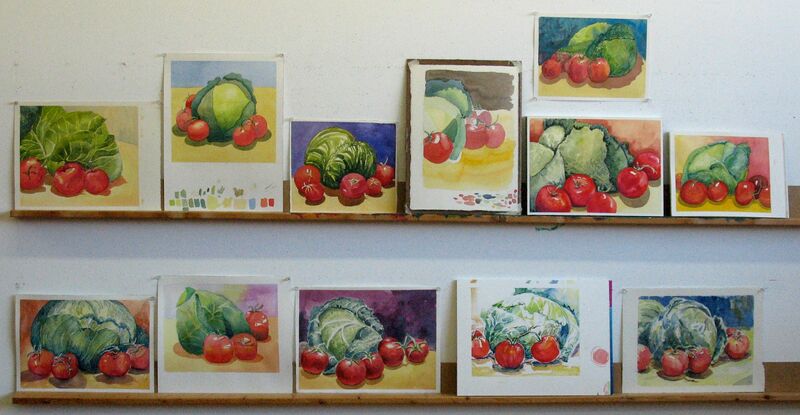 The cabbages were painted with a traditional ‘light to dark’ and ‘big to small’ approach. The big, broad leafy shapes went in first and the smaller, darker shapes last. Overall, I tried to think of the cabbage as a sphere. The light strikes it from above. 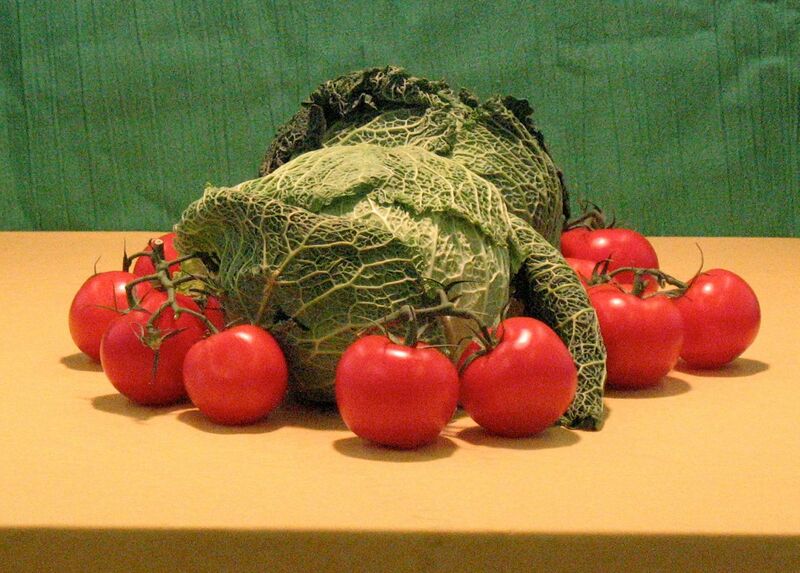 The lower part of the cabbage is turning away from the light as it drops down to the tabletop. It gets darker and cooler. Initially, the texture of the cabbages struck fear into the hearts of many of the students but nobody blinked. As a matter of fact, both the AM and PM groups became very engaged with the subject and there was quite a buzz when the paintings went up at critique time. 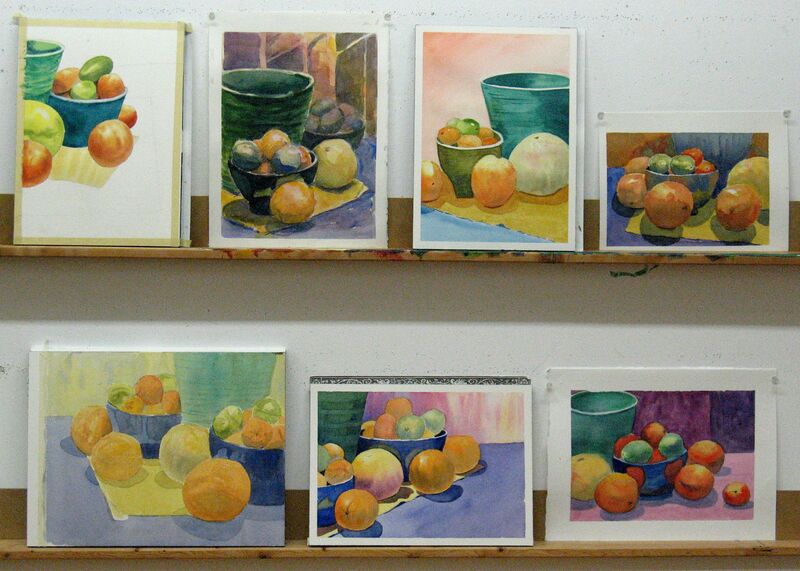 The Saturday class painted these oranges, grapefruits and limes. 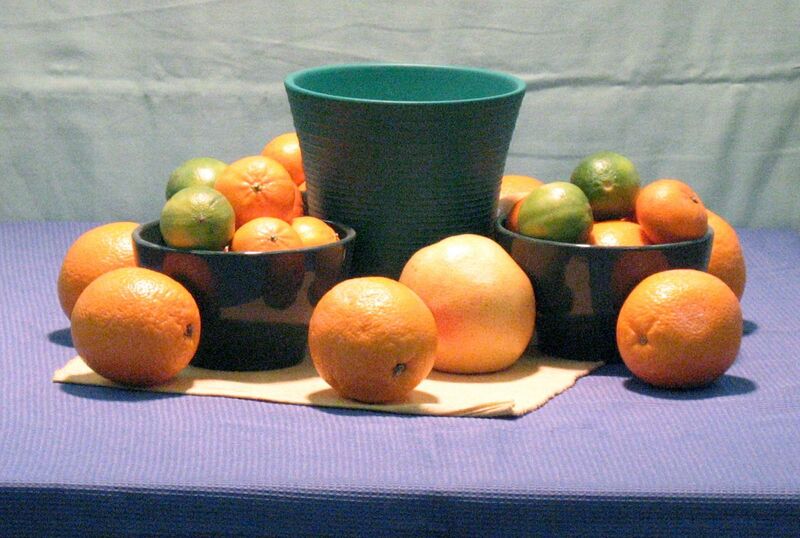 Today, I simplified the still life by removing some of the clementines and limes from the table top. The Tuesday classes are three hours long, as opposed to the full day on Saturday, and I wanted the students to be able to focus on a few less objects. It’s still a colourful subject and colour is what we talked about at the start of each class. Our numbers were down a bit on Tuesday, some on holiday and some under the weather. It’s that time of year. There are still lots of paintings to look at and I always enjoy the variety in the work. I think this statement really hits the nail on the head. An understanding of value not only contributes greatly to the development of an artist but to a new appreciation of the visual world. 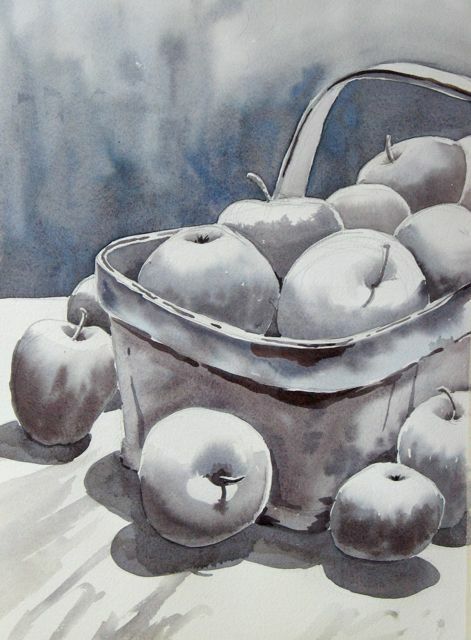 We got to a good start last week by concentrating on value and it’s source; light and shadow. Yesterday, I discussed it again and started my demonstration with greys mixed from Cobalt Blue and Burnt Sienna. I’m not going to show you my demo, however. I’m going to let a few of the students tell the story. The paintings below show the development of values and relationships in the subject. This is the first time that Kim Magee has done this exercise. She’s kept her greys very consistent and has done a very good job of simplification. Barb has more watercolour experience than Kim and has taken the contrast farther with strong, dramatic darks. Colour control is good except for the background, which is bluer than the rest of the painting. Still, excellent work. Michele has an almost teal hue to her greys so it will be interesting to see how the colour looks when added. Her colour consistency and simplification are admirable. Her whites look yellowish but that’s the fault of the photographer, yours truly, and not the artist. After the value aspect of the paintings was completed, we ‘glazed’ colour over the local areas. The colour was applied very gently. The underlying grey washes were absolutely dry before the colour was applied. Many of the early English watercolour painters developed their work with values in grey before applying colour. 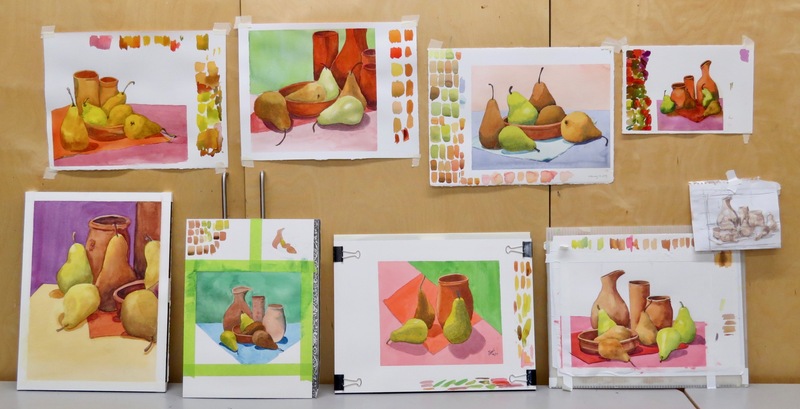 It’s a time-honoured approach that still rewards watercolour artists and students today. Can you identify the paintings shown above in the Critique collections below?